Starting from the beginning of 1990s Estonia has lived in extensive period of construction and renovation. This is caused by political and economical changes, which followed to Independence Declaration in 1991. Shift from public to private property has led to major construction projects of new buildings and roads. This intensive period of development has had strong influence on peoples taste and preferences- “everything that is new and imported from outside the country is attractive, but everything from past and homemade is not worth considering.” This kind of attitude has resulted in several cases of destroying culturally and historically important buildings and wasting valuable materials. Also environmental thinking has developed opposite direction compared to Western European countries-the idea of recycling has gained some attention only in few recent years. Fortunately, there are organizations, which promote sustainable thinking and resource saving economy. One of these is Information Center for Sustainable Renovation (SRIK), whose main project called materjalid.net is supporting reuse of old building materials. Tallinn and other Estonian cities are rich in original preserved wooden dwelling districts, which value lies in their integral milieu and human environment. Among other things also the use of sustainable and friendly materials should contribute to the integrity of milieu. materjalid.net is a project started by Center for Sustainable Renovation (SRIK) and Tallinn Cultural Heritage Department two years ago. Initiative came from Tarmo Elvisto, who is working for SRIK. He is passionate promoter of sustainable thinking and renovation. The concept of the project for recycling used materials and building items was created with the support from renovators and other specialists, whose community in Estonia is very strong and supportive. Project intends to provide people with information about old and used materials and details in order they could find again usage and enrich environment. The aim of the project is to organize collecting, detaching, stocking and transportation of valuable used building and construction items starting from door handles and postbox labels to bricks, stairways and roof details. Information regarding old materials and details, which are worth collecting and recycling, is provided by construction companies or real estate companies, who are developing new projects on the lots, where old buildings will be replaced by new ones. Very often information regarding available used details is provided also by civilians interested in sustainable lifestyle. Project manager Valdur Lillemets is organizing transportation and stocking of materials and is also providing information about new findings via web page. People interested in buying used details, can make booking via web-page or visit stock, where materials are preserved. Besides buying the items, people can also attend special courses and workshops about sustainable renovation. Therefore project is also a kind of educational way to shape peoples mind towards sustainable thinking. Instead just throwing away things that have served us lifelong, people are taught, how to lengthen their lifecycle by generation or two. Project materjalid.net was started in the beginning of year 2002. This kind of projects can be found also in other European countries, especially in Nordic area. On the other hand, in the region of old soviet countries, this kind of sustainable thinking and recycling of used materials, is not yet diffused. In Estonia, the project initiated in Tallinn can be considered as pilot, while in other cities the similar facilities for stocking and preserving used materials will be opened by the members of materjalid.net in the near future. This project can be considered as optimized. Two years of experience has created effective network of people and organizations, which exchange information regarding old buildings, where used materials can be found and detached. Also, the other end of the network is working well, which means that community of citizens, who are interested in reusing of old materials in their renovation projects, is growing considerably. Development in stocking and preserving process is next step to be taken in order to improve the service. Right now the conditions for preserving the materials are very poor, basically it is the open air lot covered with roof. For instance, wooden details would not survive very long in these conditions. Project was started with the help and funding from Center for Sustainable Renovation (SRIK) and Tallinn Cultural Heritage Department. Its further development has been organized as non- profit organization, which operating costs are financed with the income from sales commission. It is intended to keep project as non-profit also in the future. Project manager, who is coordinating everyday interactions of the project, gets paid on the basis of sales commission. Major developments, such as bigger stocking facilities, will be hopefully financed with the help and funding from specific organizations, such as European Union Structural Funds. Application letter for abovementioned organization will be submitted in the near future. New social groups interested in sustainable renovation and recycling of used materials are emerging thanks to workshops regularly organized by materjalid.net coordinators. Participation in workshops encourages personal involvement in renovation process of living facilities. It also shapes peoples minds towards caring attitude regarding the environment they are living in. Nevertheless, more active promotion via mass communication canals would increase citizens’ awareness about options to use old materials in renovation process. There is still very low percentage of citizens, who are aware of sustainable renovation and options about living in original wooden dwelling districts. 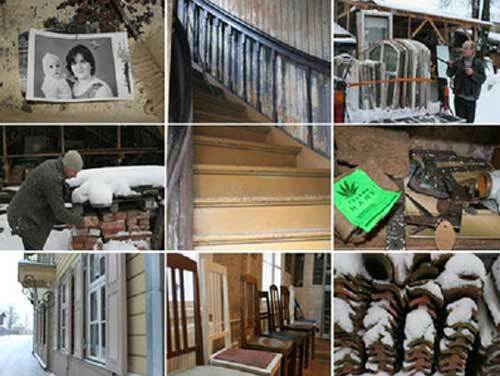 The overall trends in Estonia are showing people carelessness and poor taste about the houses they are living in. Recycling of used materials is directly connected to sustainable thinking and resource saving economy. There is no need for using extra energy or production resources when old materials are used instead of new ones. Compared to new construction materials, the used materials are also usually produced in traditional techniques, which means, that they are not harmful for environment. Families, who are buying used materials for renovating their living facilities, are saving money, because new materials costs are higher compared to used materials. In fact, the option to save money is very often the main reason for young families to buy used materials. No author associated to the case.